It's a big game tonight and there is one man who we all hope is going to step up and take this tie by the scruff of the neck. 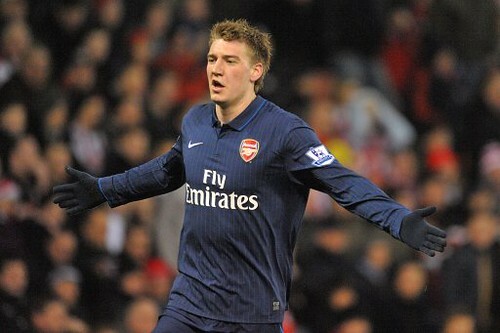 Nicklas Bendtner had a frustrating game on Saturday. He was in the right places but he couldn't hit a barn door. He was just having one of those days. Previously he had scored in his last two Premier League games (Stoke, Sunderland) and for Denmark. He offers so much to our team. Of course he has the height (6ft4) but that physical presence isn't the only thing he has in his locker. He has pace, a trick or two and will run at players. Sometimes his first touch isn't great, but that will come. And he won't hide. He's seen what happens when the fans don't think you're putting the effort in (Eboue), so will run down the defenders to try and win the ball back. That first line of defence from attack in my opinion helps our games and provides the defence and midfield with more of a restbite. Tonight against Porto, I think he'll prove his importance to us. He may not score the goals tonight, but he will worry their defence. It's time for him to step up and prove to the fans that his belief in himself to be a top player is correct. He'll start in the middle of a front three, with Walcott on the right and Arshavin on the left. With Cesc Fabregas deemed not to be fit enough to be risked, the excellent Samir Nasri will take his place in the midfield. Alex Song will be back for tonight's game. I expect Sol Campbell to start in defence with Thomas Vermaelen. So my team: Almunia, Sagna, Campbell, Vermaelen, Clichy, Nasri, Song, Diaby, Walcott, Bendtner, Arshavin. It's going to be tough, but I'm positive we can win.